Rediff.com » Movies » Punjabi Cinema gets BIG! 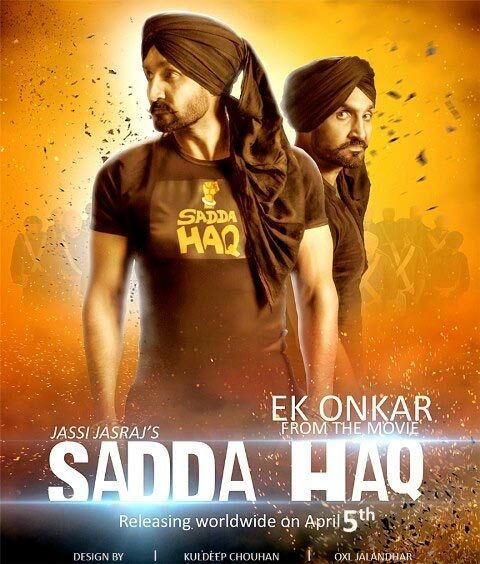 The Punjabi film industry is going through an explosion, with a film releasing every third day. Aabhas Sharma catches the action. Jayanti Majri, home to the famous temple of Jayanti Devi, one the seven goddesses of Kangra, is a village about 25 km from Chandigarh. It's the peak of summer, and most villagers are inside their homes. A few stray dogs loiter in the dust. The only person in sight is a policeman. A Punjabi film, Heer and Hero, is being shot and I am here to meet its director, Sagar Sharma. "Where is the shoot happening?" I ask the policeman. With a sheepish grin, the man says that he is actually an actor and waiting for his jodidaar, or fellow actor. The shoot is down the road. Once the jodidaar turns up, it's clear why the actor dressed as the policeman chose to be away, out of Sharma's sight: the director launches a volley of Punjabi expletives at the two actors for making the crew wait. They duck into their vanity van, actually a truck with curtains on the side, and are ready for the shot in five minutes. It is clear that Sharma has put together the crew with great difficulty -- so much so that he is even ready to shoot in this blistering heat. In the particular scene being shot, the hero has to run away with the heroine, along with his two friends, on her wedding day. They are supposed to pass over a bridge on a stream. The bridge is fine but the stream has dried up in the heat. But koi gal nahin, the shot must be canned. A few locals begin to grumble as the shooting has blocked the only road through the village and their tractors are stuck. Film shoots are no longer a novelty for them. After all, West is West, the British film, was shot here some time back. A few hours later, as the day's work ends, Sharma gathers the entire crew in a huddle. "Tomorrow," he tells them, "we work harder, wrap up work quickly and make sure there are no delays." Jo Bole So Nihaal, Sat Sri Akal, the crew acknowledges his passionate plea. The chaos at Jayanti Majri reflects how Pollywood, the world of Punjabi cinema, has exploded in the last few years. The industry, which used to release barely six films till 2002, is gearing up to churn out 120 this year. That's a new film every third day of the year. The stakes are getting bigger. Heer and Hero, for instance, is being made on a budget of Rs 3 crore and stars Bollywood actors Minissha Lamba and Arya Babbar. Naturally, the quality has improved too. Loud action films like Jatt da Gandasa and Badla Jatti Da have given way to comedies like Carry on Jatta, Jatt Airways, Naughty Jatts, or Jatts in Golmaal and rom-coms like Jatt and Juliet. The fascination with Jatts (farmer-soldier Sikhs) remains incurable. Bollywood production houses like Eros, Tips, T-Series and Big Pictures have sensed the opportunity and have ventured into this very boisterous industry in the last four years. Cricketer Harbhajan Singh, too, is trying his luck on this new pitch: he has formed a production house and will soon appear in a film titled, for now, Paaji in Problem. Akshay Kumar has bought the remake rights for Jatt and Juliet -- a first for Punjabi films -- for Rs 4 crore. The 2011 blockbuster played to packed cinema halls for two consecutive weeks and made Rs 30 crore. Its sequel, Jatt and Juliet 2, will release later this month. Eros has signed a four-year deal with Jimmy Shergill's production house, Jimmy Shergill Productions, because Pollywood has big potential "both in India and overseas". Jinhe Mera Dul Luteya, a 2011 release and one of the biggest grossers in Pollywood, raked in Rs 5.5 crore from the overseas markets alone. Multiplexes have mushroomed. In 2007, Punjab had only four multiplexes; today there are 42. "This is the best time for Punjabi cinema," says Shergill over phone from Mumbai. Such is the popularity of Punjabi films in the state that Hindi films don't get more than three or four shows a day in a multiplex. "Aashiqui 2 (Hindi) and Lucky di Unlucky Story (Punjabi) released on the same day. While the Punjabi film got 22 shows, the Hindi one only got three shows," says a manager of Big Cinemas in Manimajra on the outskirts of Chandigarh. Movies like Carry on Jatta, Saadi Love Story, Tu Mera 22 Mein Tera 22 [read as Tu Mera baayi, Mein Tera baayi] and Singh vs Kaur have raked in more than Rs 10 crore each. Given that none incurs more than Rs 4 crore in production costs, this is great return on investment. An average Punjabi film has a shooting schedule of 35-40 days. "Punjabi cinema is undergoing a makeover," says Sharma, who is directing his second film and is delighted with getting known names like Babbar and Lamba in his movie. He wears a floppy hat, a white belt holds his denim trousers to his frail frame, and chooses to speak in a mix of Hindi and Punjabi. 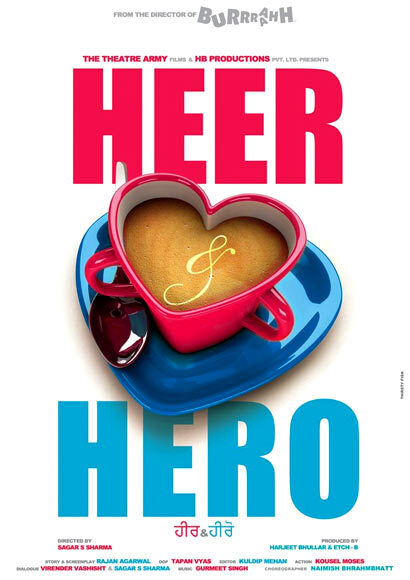 Heer and Hero is produced by Harjeet Bhullar (also known as "H-B"), along with Theatre Army, a production house that is cashing in on the boom in Punjabi cinema. To understand what brought about this change, I meet Gaurav Sharma aka "Gabbar" of Theatre Army at the Cafe Coffee Day Lounge in Chandigarh's Sector-35. While comfortable in English, he says if it isn't a problem, we can have the conversation in Punjabi. He comes across as someone who at a very young age -- he is 27 -- has learnt the ropes of the trade. In fact, nobody in his outfit is above 30. From doing location hunting and line production for Hindi films like Mausam, Sharma is looking to produce films. "Money has come in at the right time," he says. Earlier, films were made by people who wanted to convert 'black into white'. A producer can show any amount of money being invested in a film. "And if it flops -- which most of them did -- he could write it off as a loss," explains Sharma. Unlike Bhojpuri movies, which are shot almost entirely in and around Mumbai, Punjabi films remain rooted close to home. Places like Chandigarh and Patiala are the hubs; Nabha is another popular destination if the script demands shots of forts and havelis. So, film crews -- equipment suppliers, make-up artists, caterers, transporters, dress makers, extras, et al -- are busy like never before and hop from one movie set to another with practised ease. "Heroines earlier went to beauty parlours and then came to the sets, but now have their own vanity vans," says Sharma. Jaswant, one of the production assistants on the sets of Heer and Hero, tells me his parents don't understand how and where he gets his money from. For looking after the catering and doing odd jobs on the movie set, he gets Rs 15,000 a month. Darshan Aulakh, who heads one of the oldest production houses in Chandigarh, says on the phone that his crew is busy almost every day. "Earlier we did a lot of work for Bollywood films but, in the last two years, Punjabi films have grown bigger." Sunny, production head at Theatre Army, says getting "crowd actors" is a big challenge. These junior actors who are your quintessential faces in the crowd are in great demand. "More than the lead actors, at times it is difficult to find their dates!" he says. Sunny, dressed in jeans and T-shirt, is just 22 and this is his third year in filmdom. Spot boys and production assistants who used to be part timers earlier now have full-time jobs -- they work all year round on film sets. Dubbing studios have popped up in Chandigarh. The Punjab government wants to set up a multi-crore film city at Mohali. Sharma rues the rising costs. "Earlier, the villagers were happy to give us their buffaloes for a shoot. Now they've become smart and demand Rs 500 for a buffalo," he chuckles. When the producers take along their own buffaloes or cows, the villagers ask to be paid for the use of chains. The actors too are floating in money. Singer, actor and producer Gippy Grewal is one of the busiest men in the industry. He charges Rs 1-1.5 crore per film and does everything from singing to dancing and, of course, acting. Sherry Maan, Roshan Prince, Alfaaz are all singers who have now become actors. The only rule for the hero is that he shouldn't have chocolate-boy looks. The much-anticipated Rangeelay, with Jimmy Shergill and Neha Dhupia in the lead roles, made only Rs 20 lakh on the first day, because, says a crew member of Heer and Hero, Shergill went for "the clean shaven look; it's not macho." In his heart of hearts, the Punjabi still looks for the "macho hero", and not a metrosexual man. Among the actresses it's Neeru Bajwa, 32, who reigns supreme. She charges Rs 70 lakh per film and every director wants to cast her as the lead. Bajwa has starred in hit films like Jatt and Juliet, Heer Ranjha and Pinky Mogey Wali. She now runs her own production house called Fresh Air Movies. "I love that different sort of roles are being written for actors in Punjabi cinema now," she says over phone from Mauritius, where she is shooting for a film. A Bollywood and national television discard, Bajwa, born and brought up in Canada, discovered her mojo six years ago when she decided to give Punjabi films a try. A few days later, at the popular Sector-17 market in Chandigarh, a sequence of Heer and Hero is being shot. A curious crowd gathers around and although there are no big stars at the shoot, two bouncers are around to keep things under check. Sharma is calmer and in a chatty mood. "A lot of the credit for the way the industry has changed goes to Manmohan Singh" -- no, he's not talking about the prime minister. Manmohan Singh, or Man G, as he is popularly known, was, for several years, the cinematographer of Yash Chopra films, including Chandni and Lamhe. He came to Punjab in the early 2000s and brought about a sense of professionalism which was missing till then. Taking a leaf out of Chopra's book, he made films that appealed to the NRI audiences and were crossover films as they struck a chord with Punjabis both at home and abroad. Before Man G made Jee Aayan Nu, starring singer-actor Harbhajan Mann, the idea of technicians and large budgets was not even considered in Punjabi films. Man G's last movie, Ajj De Ranjhe, was produced by Reliance Entertainment. This was a welcome break from the past. The 1980s are considered a forgettable phase for Punjabi cinema. Mehar Mittal, a tax lawyer by profession, became the face of Punjabi films -- Fauji Chacha, Kartar Mama, Sheran de Putt Sher. Double, even triple, entendre was his forte. Next came the era of crass action films, of which the biggest star was Yograj Singh, cricketer Yuvraj Singh's father. "These films didn't have any appeal outside of Punjab," says Anurag Singh, whose breakthrough film was Yaar Anmulle in 2011 -- a film about three college friends and their life in university. "It was a genre which was unexplored and the audience loved it," says Singh, who also has to his credit Jatt and Juliet. To get a feel of the passion for Punjabi cinema, I go to the Fun Republic multiplex in Manimajra, where Sadda Haq is playing to a packed house. It is night but the crowds are chirpy and enthusiastic. There are youngsters and families. "It's the third week and the crowds are still coming in," says the man at the ticket counter. A couple of years ago, a "serious" film like Sadda Haq wouldn't have run beyond one week, he says. Today, the crowds are appreciative of serious cinema. That's perhaps why Punjabi films are now being released in territories like Delhi, Haryana, Himachal Pradesh and even Madhya Pradesh. Overseas markets like Canada, US and UK have become attractive. Newer countries like Singapore and Malaysia have emerged on the radar of distributors. Pollywood's time has come.